Montessori Education is based on the work of Dr. Maria Montessori, the first woman to receive a medical degree from the University of Rome. As a physician, she was especially drawn to the children in the clinics she visited. As she worked with them, she applied the scientific method. She created materials for the children, observed them as they used the materials and developed theories to explain what she observed. Today, more than 100 years later, many innovations in early childhood education are based on principles identified by Maria Montessori. Having lived through two world wars, Dr. Montessori was a strong advocate for peace. She was a three-time nominee for the Nobel Peace Prize, and firmly believed that the education of children was the key to future peace. She died in 1952 and is memorialized as a citizen of the world. Dr. Montessori found that children have a special desire and capability to learn from birth. Her approach recognizes that young children progress through stages of learning, each at his or her own pace, and children of different ages teach and learn from each other. The Montessori classroom helps children learn at their own rate with consideration for differences in age, temperament, drive and interest. In the carefully prepared environment of the Montessori classroom, children are free to move about and to choose their own materials and activities. They may work alone, in a group, or with a teacher. Because the Montessori environment helps each child develop self control, the classroom is a peaceful yet busy place where children move through the curriculum in an orderly fashion at their own pace. 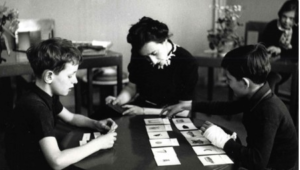 Because there are so many interpretations of Dr. Montessori’s work we suggest that you arrange a classroom observation to determine if our school is a good match for your family. To arrange an observation call the office at (860) 889-0340.